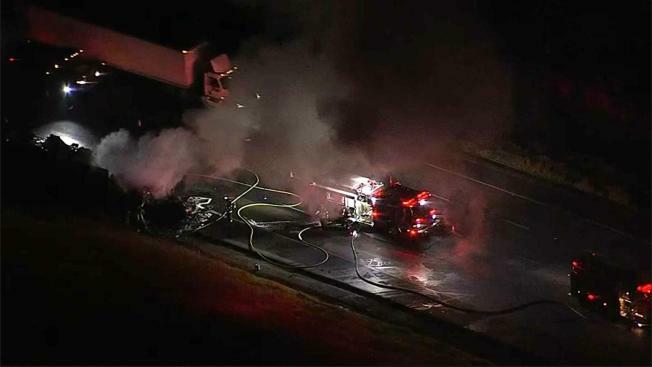 Multiple lanes of westbound Interstate Highway 580 near the summit of the Altamont Pass in unincorporated Alameda County are currently blocked due to a big rig fire early Tuesday morning, according to the California Highway Patrol. The CHP said the fire was first reported around 3:48 a.m. and a Sig-alert was issued around 4:30 a.m., the CHP said. An occupant in the big rig was able to get out and was uninjured. All lanes were blocked for a short time around 4:50 a.m. but the No. 1 lane had reopened as of 5 a.m. There is no estimated time of when all lanes would be cleared.